In order to give Michele a fighting chance to prepare Thanksgiving Dinner for her family, I took the kids on an 11.5 mile bike ride on the Trumbull Rail Trail. 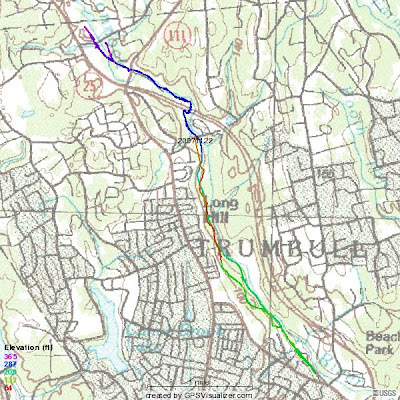 We started at Whitney Avenue and rode the new section that heads north, which passes by Parlor Rock, and goes under Rte 25 along side the Pequonnock River, since the original roadbed is blocked by the high way. Unfortunately, there are two parts of this section of the trail that are not completed and it made riding through there impossible. One was under the high way and the other was near Old Mine Park. Here is picture of me, taken by Katie, with the infamous Dumpgoose 69er. This bike is something that a buddy of mine found at the town dump and thought I might be able to do something with, and as you can I was able to. It's probably the only single speed mountain bike with center suspension and two different sized wheels. The center suspension is actually pretty nice because it acts like a shock post. As with every ride with the kids, it's always punctuated with plenty of snack breaks and hamming it up for the camera. Juice boxes are always a big hit. The boys love riding in the Burley and funny thing is that they can be so quite that I have to stop from time to time to check and see if they are not sleeping. Elliot usually falls to sleep but the last couple rides with both boys they just like to see scenery go buy. Of course with the wet trails and mud in a few places I realized that Brodie was on the receiving end of everything from my rear tire so I put up the screen. Brodie didn't like it at first but he quickly got used to it. Here is one of the sections of the trail that still needs a lot of work. Katie love to go fast.